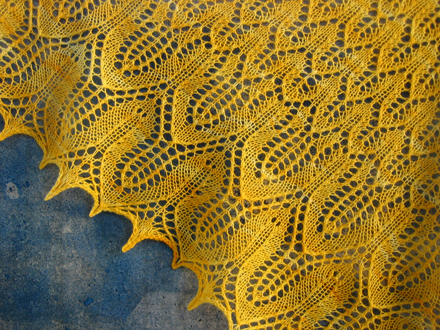 A chevron lace pattern is reminiscent of the seeds and jumbo petals of an overgrown sunflower. Knit in a bright and saturated yellow, it can bring sun to the gloomiest of rainy days. sizing Instructions for two sizes, scarf sized and larger shawl size are given. Pattern can be knit using lace, sock or dk weight yarn. Finished shawl will measure 52" x 20" to 82" x 34" depending on yarn weight, and pattern size chosen. Pattern includes detailed sizing information. gauge and suggested needles lace weight - US # 5 / 3.75mm needles, to achieve a gauge of 26 sts / 4"
sock weight - US # 6 / 4.0mm needles, to achieve a gauge of 22 sts / 4"
DK weight - US #7 / 4.5mm needles, to achieve a gauge of 20 sts / 4"
notes The pattern includes both charts and written instructions to represent lace pattern. All wrong-side rows are simply purled.